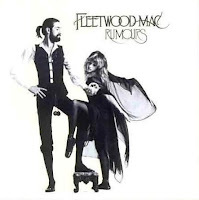 According to John Tobler’s This Day In Rock (Carroll & Graf, 1993), on this day in 1977, Fleetwood Mac released one of the biggest-selling rock albums of all time, RUMOURS. The album is still in the Top Ten of the Top Selling Records of All Time despite being surpassed in recent years by Garth Brooks and Shania Twain, having sold to date 19 million copies, more or less the same number as The Beatles’ “white album.” It is astonishing that the album nonetheless has sold ten million fewer copies than The Eagles’ Their Greatest Hits 1971-1975, the all-time sales leader. While lists—lists being a form of indexing—of best sellers are no doubt interesting as well as provocative, such lists also make it difficult to determine the historical importance of an album, if by importance we mean significance. Although RUMOURS sold more in terms of copies than Fleetwood Mac’s previous, eponymously titled album, and more copies than the band’s subsequent album, TUSK, is it historically more important than either of these two other albums? Perhaps it is time to explore the importance of “importance.” For “importance” is the word normally invoked whenever popular music becomes an object of academic study. Many articles and books have been written on so-called “important” albums and musicians, in which the critic, by necessity, makes the assertion that such-and-such is “important.” And yet inevitably, as Simon Frith has observed, whenever a particular album (or musician) is deemed “important,” a study of ideological effects ensues, following conventionalized, highly predictable routes (see the first twenty pages of Performing Rites: On the Value of Popular Music, Harvard University Press, 1996). If the determination of “importance” allows us to designate the significance of a particular album or musician, what sorts of information does the designation also happen to repress? The problem with “importance,” as a designation of significance, is that it leads to an uncritical identification with a particular album or musician, which is why analyses seeking to establish importance inevitably follow the predictable path of ideology. The trick is to establish significance while still remaining critically aloof, if not disinterested, in the object of study, not because the object is analogous to a specimen under a microscope, but to avoid predictability and redundancy, or pleonasm.